People: Mainly Melanesian, but some Polynesian and Micronesian, Papuan and Negrito. Language(s): There are over 820 different languages with English, Pidgin and Hiri Motu the most widely spoken. Religion(s): PNG's constitution declares that PNG is a Christian country. 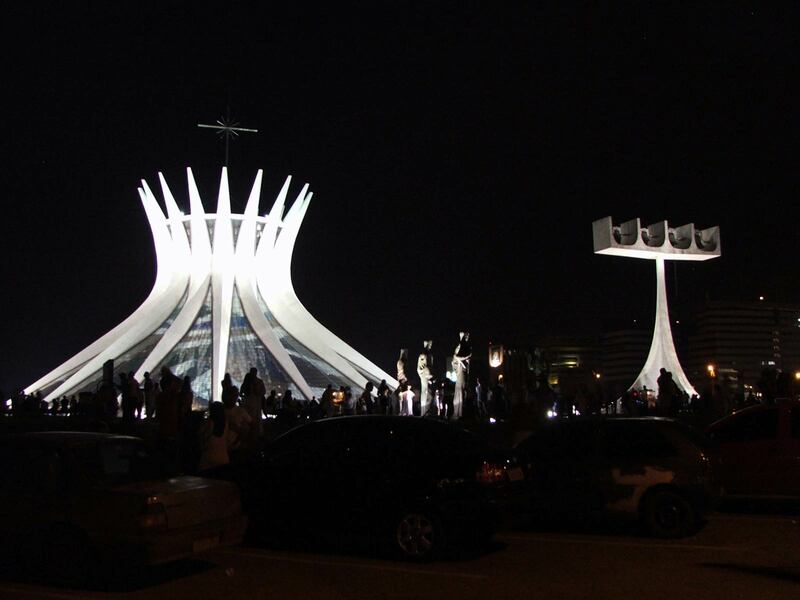 About 27 % are Catholics, 19 % Evangelical Lutheran, 11.5 % belong to the United Church and the remaining Christians follow the Evangelical Alliance, Seventh-Day Adventist, Pentecostal, Baptist and Anglican churches. Declared Buddhists, Muslims and Hindus each number in the hundreds. Major political parties: People’s National Congress Party, National Alliance,Papua New Guinea Party, United Resources Party , People’s Democratic Movement Party, United Party People's Progress Party, Social Democratic Party, Triumph, Heritage Empowerment Rural Party. Government: PNG is a Realm within the Commonwealth with a democratically elected government based on the Westminster model. Executive power lies with the Prime Minister and the National Executive Council (NEC) - the Cabinet. Head of State: Her Majesty Queen Elizabeth II (since 6 February 1952), represented by Governor-General Sir Michael Ogio GCMG, CBE. Membership of international groups/organisations: United Nations (UN), Commonwealth, International Monetary Fund, World Bank; Asian Development Bank (ADB), Asia Pacific Economic Co-operation (APEC), World Trade Organisation (WTO), Pacific Islands Forum, South Pacific Commission, and Melanesian Spearhead Group. PNG is also an Associate Member of ASEAN. Life expectancy in PNG is 57 years. The leading causes of death are malaria, pneumonia, peri-natal deaths, tuberculosis, meningitis, heart disease, cancer, accidents and violence. PNG also has one of the highest maternal mortality rates in East Asia with more than 2,600 deaths every year. Health care remains basic and many of these deaths could be prevented with more medicinal care and advice. HIV/AIDS has become one of the leading causes of death in Port Moresby and elsewhere in the country. PNG currently has the highest HIV/Aids infection rate in Eat Asia. More than two percent of the population is believed to be infected and urgent steps are being taken to try to prevent the spread. But PNG is likely to become a major HIV/AIDS epicentre within ten years. Major industries: PNG's economy is a dual economy; a 'modern' economy based on mining (gold, silver, copper, nickel) and petroleum and natural gas production, and a 'traditional' economy based on fishing, forestry, coffee, palm oil, copra, cocoa and vanilla. Current strengths are rich natural resources and strong foreign donor support. High international prices for major export commodities drive a strong export performance, helping to realise stability in the exchange rate and a record level of foreign exchange reserves equivalent to seven months import cover. A consortium led by a major American oil company is delivering the commercialisation of the country's estimated 227 billion cubic meters of natural gas reserves through the construction of a liquefied natural gas (LNG) production facility. The project has the potential to double the GDP of Papua New Guinea. Trade and investment with the UK: There is approximately £600 million worth of British trade in PNG. The Swire Group of Companies, Maybey Bridge (bridges), Price Waterhouse Coopers (Consultancy), Courts (retail), British American Tobacco, Arup Pacific Pty Ltd (consulting engineers), Intercontinental Hotel Group and Rio Tinto are among the British companies with subsidiaries in PNG. Aid and development: Australia is the largest foreign aid donor to PNG; it will contribute $463.5 million in aid during 2011-2012. The next largest donor is the EU. There is no UK bilateral aid programme, but the UK contributes AUD $5 million a year to PNG's development through the European Union. The UK Government also funds a network of more than 60 advisers in PNG. 55 of these operate through the UK Volunteer Service Overseas Network with a further five ODI fellows on attachment to Government Departments. The British High Commission also administers a small-scale Bi-lateral Fund. In 1884, Germany raised its flag in the north while the UK raised its own in the south. Formal division was established between German New Guinea and British Papua in 1886. British Papua was handed over to Australia in 1906. Australia took control of German New Guinea at the outbreak of the First World War. In 1949, the Trust Territory of Papua and New Guinea was given to Australia to administer until self-government on 1 December 1973. Papua New Guinea became a wholly independent State on 16 September 1975. After 30 years of independence, PNG still faces major challenges. HIV/AIDS is growing towards southern African proportions, fuelled in part by extraordinary levels of violence against females. Serious law and order problems hinder inward investment. An under-performing public service and corruption also slows development. Logging takes its toll on the diminishing rainforest. Education and health services remain weak and are difficult for many to access due to poor road communications. Such access difficulties also hamper development of rural economies. Bougainville Island, part of PNG, has a history of separatist feelings. Behind some Bougainvilleans' separatism was the view that the money from the Panguna Copper Mine, a development which accounted for much of PNG's export revenue, was going to the national government and overseas and not back to the local community. This simmering resentment, together with other local tensions, led to the outbreak of hostilities in 1989. The conflict spread throughout the island and lasted 9 years. Twenty thousand Bougainvilleans lost their lives. After lengthy negotiations, the Comprehensive Political Settlement was struck between the Government of PNG and provincial leaders in August 2001, ending the civil war in Bougainville. The agreement gave Bougainville the right to exceptional autonomy within PNG and granted the province the option of a referendum on its future political status, including the option of independence, to be held 10 to 15 years after the election of an autonomous Bougainville Government. The agreement also included a Weapons Disposal Programme, to which the UK contributed financial support. The autonomous elections took place in May 2005, and the Autonomous Bougainville Government (ABG) was inaugurated on 15 June 2005. With the formation of the ABG, the Organic Law of Provincial Government and Local Level Governments, which operate everywhere else in PNG, ceased to apply in Bougainville. Bougainville has four Members of the PNG National Parliament who are entitled to attend and speak in the Bougainville House of Representatives but they cannot move motions, vote or be counted towards a quorum. They however have the same entitlements as all other National MPs. Late President Joseph Kabui, the 1st President for the Autonomous Region of Bougainville passed away in June 2008. His successor, James Tanis held the position until May 2010. On 8 June 2010, John Momis was elected president. Momis, a former Catholic priest and PNG ambassador to China, was inaugurated with the other 39 elected Members of the Autonomous Bougainville Region House of Representatives on 15 June 2010. Australia is PNG's most engaged partner. Along with considerable economic aid and technical assistance, including in areas of good governance, Australia also provides assistance to the PNG Defence Forces. PNG is a member of the Pacific Island Forum and the South Pacific Commission, and regional sub-groupings such as the South Pacific Regional Environmental Program (SPREP). PNG has also been a major player in the Melanesian Spearhead Group – a political/economic group established in 1988. PNG is a member of the UN, WTO and APEC, and is an Associate Member of ASEAN, and signed a Treaty of Amity and Co-operation with that organisation in 1989. PNG maintains official overseas representation in the UK, Australia, New Zealand, Fiji, Solomon Islands, Indonesia, Singapore, Malaysia, Japan, the Republic of Korea, China, the Philippines, the United States, the EU in Brussels, and the United Nations in New York. Bilateral relations with the UK are good The UK has strong historical, political and commercial links with PNG. We share a Head of State, have a significant and influential UK community and remain close partners in the UN and Commonwealth. 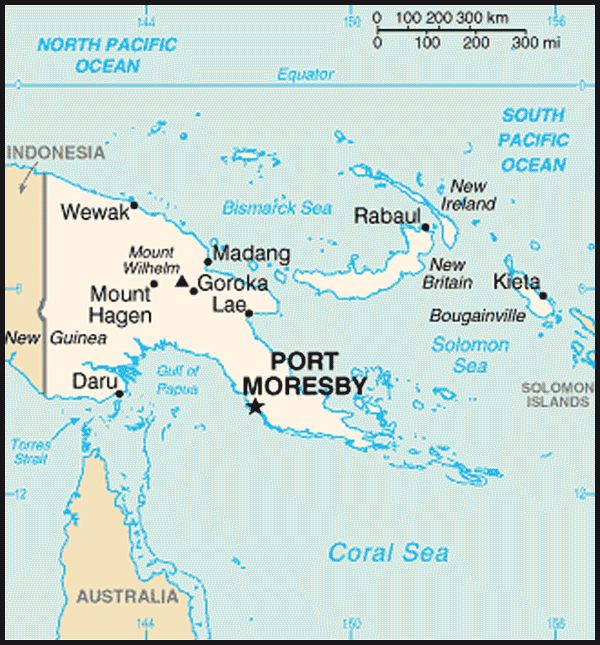 PNG occupies the eastern half of the island of New Guinea, as well as numerous smaller islands and atolls. The country's geography is extremely diverse with a spine of rugged mountains running the length of the island forming the Highlands, (1200 - 2800m). The coastal plains feature spectacular coral reefs and many hundreds of smaller islands with the most notable being New Britain, New Ireland and Bougainville. 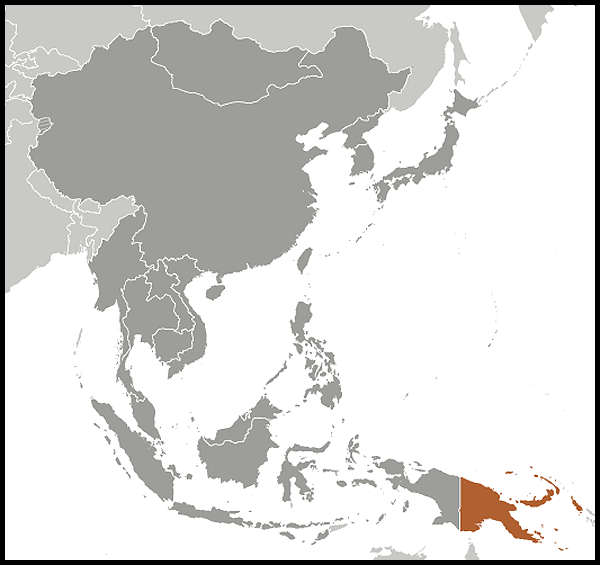 Its neighbours are Indonesia to the west, Australia to the south, the Solomon Islands to the east and the U.S. territory of Guam to the north. The land area is approximately 463,000km² with only 27% of the total landmass inhabited. Large variations in landform cause an extremely diverse range of natural environments. There are 24 dormant and 16 active volcanoes and eruptions are frequent. A number of major rivers drain the mainland, including the Sepik River in the north and the Fly River in the South. These rivers have associated swamps and seasonally inundated floodplains that cover large areas. Almost 50% of the total land area is mountainous and 20% is seasonally or permanently flooded. National politics are characterised by a plethora of political parties, coalition governments, shifting party loyalties and motions of no-confidence in the leadership (many of which have succeeded). There is considerable instability to political proceedings in PNG. Under present conditions, elected governments are guaranteed a period of grace 18 months after election before they can be subject to confidence votes. This also applies to the last 12 months prior to a general election, which are held every five years. The Coalition Government of 2002-2007 was the first to run full term. The next elections are scheduled for 2012. Elections were held in June and July 2007. A coalition government was formed by the National Alliance Party with coalition partners taken from 12 additional political parties. The leader of the National Alliance Party, Sir Michael Somare MP retained his position of Prime Minister for a second consecutive term. Sir Michael was the first Prime Minister of PNG after it obtained independence in 1975 and subsequently during the periods 1982 - 1985 and 2002 - 2011. In 2011 Sir Michael Somare was in Singapore for a prolonged period of time, receiving medical treatment. In his absence Rt Hon Sam Abal was appointed acting Prime Minister. However, on 2 August 2011, Peter O’Neill, a former member of Somare’s ruling party, successfully tabled a vote of no confidence in Somare and was subsequently elected as the Prime Minister. He was sworn in a day later by the Governor General. On 12 December 2011, O’Neill’s appointment was brought into doubt after the Supreme Court’s ruling that the dismissal of Somare was unlawful. O’Neill continues to be recognised by the majority of MPs and the Speaker as the legitimate Prime Minister. There remain a range of legal challenges outstanding with relation to the way in which O’Neill was elected and subsequent actions by those involved. Since independence, members have been elected by the first past the post system, with winners frequently gaining less than 15% of the vote. Electoral reforms in 2001 introduced the Limited Preferential Vote system (LPV), a version of the Alternative Vote. The national elections in June and July 2007 were the first to be conducted using LPV. In early 2011, PNG underwent their Universal Periodic Review at the UN where the UK raised its concerns over their human rights record. A full report of Papua New Guinea’s UPR can be found on the UN website. PNG suffers from corruption and serious law and order problems. Access to education and health services are poor and getting worse. The police force is prone to violence and corruption. HIV/AIDS has become one of the leading causes of death in PNG. The media in PNG is refreshingly open and the Constitution provides for free speech, including freedom of the media. The Internal Security Minister periodically condemns the numerous instances of Police brutality, corruption and collusion. The judiciary is largely independent but slow. Remand prisoners can remain in custody for many months and prison conditions are poor. Men traditionally dominate PNG Society and gender imbalance runs deep. Violent crime, especially against women and children, continues to increase and there are no signs of it abating despite extensive anti-violence campaigns by local authorities and donors. On current projections, it is predicted that PNG will not meet any of the Millennium Development Goals and is particularly trailing behind in maternal mortality.